Bill Capps has always considered himself a regular guy. The Auburn University surplus manager likes to fish, play with his Boston Terriers and spend time with his wife. He’s also a philanthropist. It’s something he never thought was possible until he was asked to be a “Phil” by the Women’s Philanthropy Board, the flagship program of the Cary Center for the Advancement of Philanthropy and Nonprofit Studies. The Phils serve as members of the men’s auxiliary of the WPB. Being a Phil requires an annual donation that helps fund scholarships, grants, mentoring initiatives and other educational programs designed to help individuals achieve independence as financial decision makers and donors. Each Phil is also featured in a colorful calendar with professional, creative photographs that help tell each donor’s story. 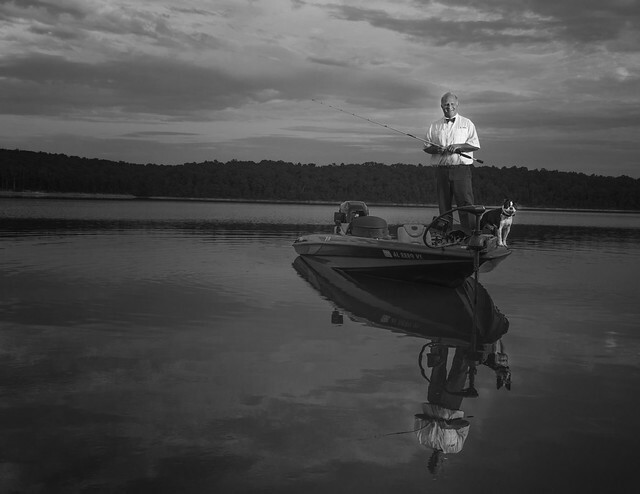 Capps is pictured on his bass fishing boat. When asked to be a “Phil,” Capps didn’t feel like it was a burden. He considered it an honor. Capps said he and his wife live a “simple life,” but they have enjoyed the Women’s Philanthropy Board events and all of the people they have met as philanthropists. The core of the Cary Center’s mission is helping participants discover their purpose through learning, giving and growing. Philanthropic engagement is a cornerstone of the program. Cary Center programs teach all ages they can leave a legacy through discovering their purpose, no matter how many resources they may have. The most satisfying part of it all is knowing his contribution is making a difference in the lives of others at Auburn, the place where he grew up and his spent his entire working career. Capps began taking classes at Auburn’s business school in 1979. He graduated in 1988, working with his father’s business and taking classes when he could. “I saw the [10 year] high school reunion going on, and I said, ‘I’ve got to complete this,’” he said with a warm smile. And he did. Capps started his career at Auburn working in the chemistry department’s Scientific Supply Store. “That was my introduction to the university,” he said. Now, he is the Surplus Manager in an auxiliary division of the university. To say Auburn is family to Capps is an understatement. He grew up on Samford Avenue when Auburn was a quiet village. His great-grandfather was a veterinary instructor in the 1920s. Both of his grandparents are Auburn graduates. His parents attended Auburn, and his wife is an Auburn graduate. His father-in-law, Les King, took scores of iconic pictures at Auburn as chief photographer on campus for years. Capps encourages other men to consider becoming a Phil through the Women’s Philanthropy Board. And what better place to contribute to than the place that has given Capps a good life? Bill Capps, surplus manager at Auburn University, is pleased to support Auburn as a Phil with the Women’s Philanthropy Board.